IJU takes strong exception on MeToo, calls media houses to constitute ICC. Taking note of MeToo movement, the Indian Journalists Union expressed solidarity for their courageous women to blow lid of sexual harassment at the hand of editor bosses and at the work places. The IJU in its 9th Plenary that concluded today at Amritsar Punjab not only condemns the cases of the sexual harassment that are coming out, but also condemned former external minister MJ Akbar for filing criminal defamation case against Priya Ramani to intimidate her and others who have accused him of sexually harassing them when he was then editor in various dailies. The IJU firmed that there has to be zero tolerance against sexual harassment and demanded from all media organisations that they must have Internal complaint Committee (ICC) in the place without any further delay at the time same they must ensure that composition of this committee is genuine and provide relief to the complainants and act against the accused. Indian largest journalists organisation also demanded from the government specially the women and child ministry as well as Group of Minister(GoM), to ensure that the management set the up the ICC in line with the Supreme Court Directives. It further stated that IJU will not view this as interference in press freedom but will ensure that the apex court directives are followed. The union also called upon state leaders to set up gender cell in its union as well as apprised its members of the guidelines, which spell out what amounts to sexual harassment. The Plenary hopes that the MeToo movement would ensure safer environment for women journalists in future and that zero tolerance against sexual harassment is advocated across organisations. The IJU further resolved and demanded the Telanaga state government to provide immediate compensation to journalists who died due to work pressure. It is said more than 220 journalists have died alone in Telangana state in the span of four years due to excessive work pressure from the management. The IJU demanded the Telangana government to implement Majithia Wage Board and provide health insurance to working journalists in the state. 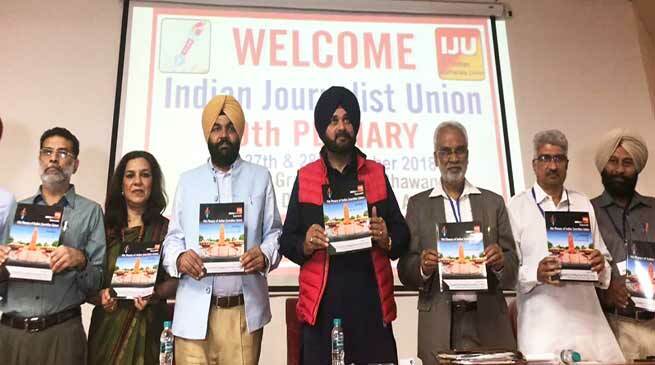 The baton of Indian Journalists Union (IJU) leadership has passed on to Amar Devulapalli as he has taken charge of new President of IJU and Sabina Inderjit as General Secretary. Amar Devulapalli and Sabina Inderjit were unanimously elected as President and General Secretary respectively. Three vice presidents namely Geethartha Pathak of Assam, Ambati Anjaneyulu of Andhra Pradesh and Balwinder Singh Jammu of Punjab respectively. Prem Nath Bhargav of Delhi retained treasurer. The IJU elected five secretaries and thirteen National Executive Committee members including Taya Bagang of Arunachal Pradesh. APUWJ member Taya Bagang is the first Arunachalee and youngest NEC member of IJU. Sushmita Goswami of Assam has been appointed NEC gender council member. Passing the leadership to his successor, out going President SN Sinha hoped that that under leadership of Amar Devullapali and Sabina Inderjit the IJU would touch new height and emerge stronger and larger organisation . Taking charge as new President Amar Devulapalli stated, “Unless media is free, no one is free in this country, be it people or organizations”. Devulapalli appealed to the host Punjab government to ensure freedom of press is intact and journalists are safe. “ If media of a country is free the country will flourished” he remarked. New General Secretary Sabina Inderjit in her speech highlighted the challenges of IJU and stated that she wants to see the changes in union movement. She also sought cooperation from the members from across the country and urged the state unit to set up gender council. She further expressed concern over the growing sexual harassment of women journalists across the country and urged the members to stand against it. Punjab government Minister of Cooperation and Jail Minister Sukhjinder Singh Randwa attended the closing ceremony of IJU 9th Plenary Session. Calling out the journalists community to be brave in disseminating information. “ You are freedom fighters, if your pen stopped, we will be again slave” said the minister referring most of freedom fighters were good writers who propagated their ideas through writings. He underscored the significant of role of media to keep healthy democracy and urged the journalists to continue in their service to nation. Congress MLA Harpartap Singh Ajnala and Punjab BJP President Swet Malik were also attended the concluding Plenary Session.